This year, my stay in the Scottish Highlands extended from February into March, and on the first of the month, I had some time to myself after all the guiding, so chose to revisit the red squirrel hide, and try my hand again at jumping shots. On previous visits, I have tended to shoot from the hide, or sometimes, sit to the side of the jump area. 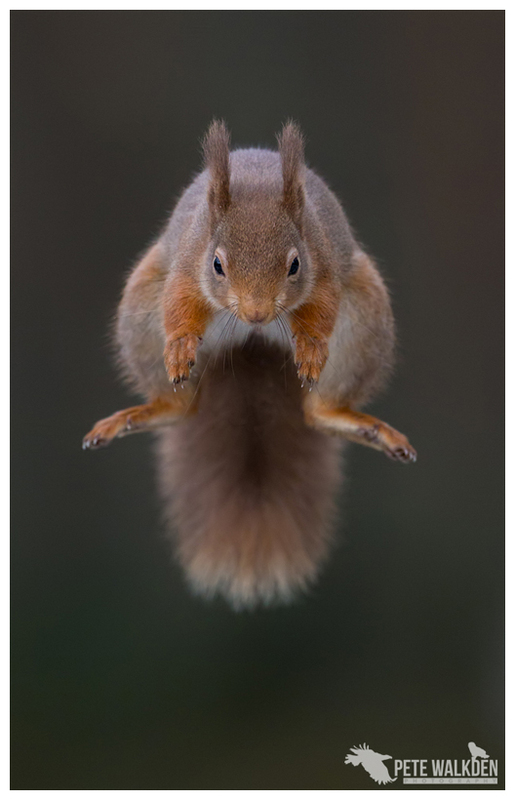 This time I rigged the camera up on a tripod, outside the hide, attached a wireless trigger, pre-focused the 500mm lens halfway through the jump-zone, and then sat back and waited. The most frequent visitor to the site is a female squirrel called "Tippy" on account of the pale end to her tail. She takes the jump in her stride, often not even hesitating on the branch before leaping across. And over a period of an hour or so, she was making the jump to collect the hazelnuts repeatedly, with me firing the camera each time. The downside to this sort of photography is that I'm unsure of what I have captured, so periodically, I'd venture outside, usually to replenish the supply of nuts, but also to check on the "aim" of the camera. Out of four images taken on each burst, mostly I would get one with the squirrel in the frame. But the trick is to get the head in focus too. On checking the images, I realised that not only had I captured Tippy as she leapt across, but she'd performed a near perfect jump, being symmetrical throughout, and she appears to be leaping down my lens. It might have been taken on the first of the month, but it's definitely worthy of the IOTM title.